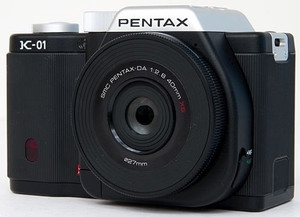 "Aside from its unique looks, the K-01 is also a full-featured interchangeable lens camera. It has a 16 Megapixel CMOS sensor, K-mount lens support with built-in image stabilization, lots of manual controls, a boatload of scene modes and special effects, an HDR function, and 1080p video recording." When the Pentax K-01 was announced, I mentioned (right in the headline no less) that Pentax cannot seem to do mirrorless cameras right. Well, in addition to all the issues that come with sticking to the K-mount instead of developing a new mount for a large sensor mirrorless camera (fat body due to large flange distance for the mirror box, slow AF with some lenses not designed for contrast detection autofocus), Pentax seems to have some terrible quality control issues here. Jeff Keller has a long history of reviewing digital cameras, but I don't think I have seen him point out so many issues in one review before! Nevertheless, if you are still interested, you can read the review, where the output from the camera is actually quite good, but given all the other issues, I think there are better mirrorless cameras out there.